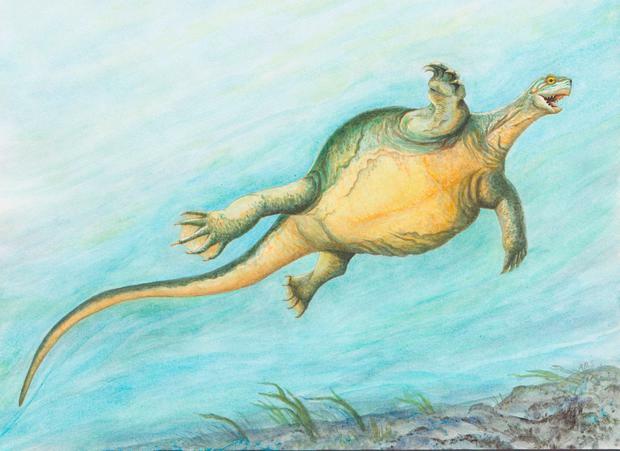 A “turtle” that lived more than 200 million years ago had a frisbee-shaped body but no shell, scientists have discovered. The newly named species, Eorhynchochelys sinensis, had evolved a toothless beak but not the other turtle hallmark, a protective shell. A complete fossilised skeleton of E. sinensis was found embedded in 228 million-year-old rocks in Guizhou Province, China. The creature is described in the latest issue of the journal ‘Nature’.